BIG’s new Toronto building gathers apartments into ‘peaks,’ which promise to offer an unusual intimacy between neighbours. "How can architecture create communities?" 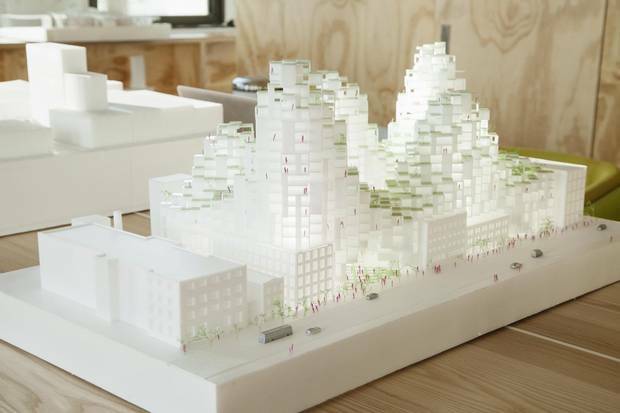 That's the title of a public talk Bjarke Ingels will deliver this week, and it captures the ambition of BIG's design for a site on downtown Toronto's King Street West. The sentiment is warm and fuzzy. The design, however, is radical: BIG has imagined a complex that would be unlike any other building in the city – or, indeed, North America. The scheme blends an unusual stack-of-blocks form, and adds a complex weave of public and private spaces underneath and within the heart of the building itself. Bjarke Ingels, starchitect: Where high design meets the street Is he a revolutionary, a huckster or a little bit of both? The world’s hottest architect is set to remake Canada’s cities. Alex Bozikovic profiles one of the most controversial figures in contemporary design. The still-unnamed project for developers Westbank and Allied REIT comprises about 725,000 square feet; plans call for more than 500 apartment units. That represents very high density on this site – the numbers are likely to be negotiated down during the process of winning city approvals. Yet, if it is built in anything like its proposed form, it will be a landmark that enriches the city's public realm. The proposal, which echoes several other schemes by BIG is for a highly sculptural courtyard building: Seen from above, it's a hollow rectangle. But the higher levels of the building are not flat slabs. Instead they break down into a grid of 12-by-12-foot modules – which Mr. Ingels calls a "pixelated" pattern – and spun at 45 degrees, so the walls and windows look out at oblique angles. These stacks would step back, like a ziggurat, to form five "peaks" around the site, reaching to between 15 and 17 storeys. On the upper levels, they would house apartments of one to three bedrooms. For the design to be successful, materials and the arrangement of the windows will need to be very carefully modulated. (The developers are thinking about cladding the exterior of the building with some sort of light-coloured stone.) So, too, will the approach to the heritage buildings on site; these will have to be rebuilt, but should remain as discrete pieces within the design. On balance, the proposal is shorter, bulkier and vastly more interesting than a skinny point tower, the kind most developers and planners would propose for a site of this location and size. Rather than a stack of repeating layouts, there will be at least a dozen different floor plans used in the various apartments. Most units would have private terraces, which the architects imagine as being heavily greened. "The scale of the project is so broken down that it almost looks like a bundle of homes rather than a big new building," Mr. Ingels argues; the effect he is going for is akin to "a Mediterranean mountain town." 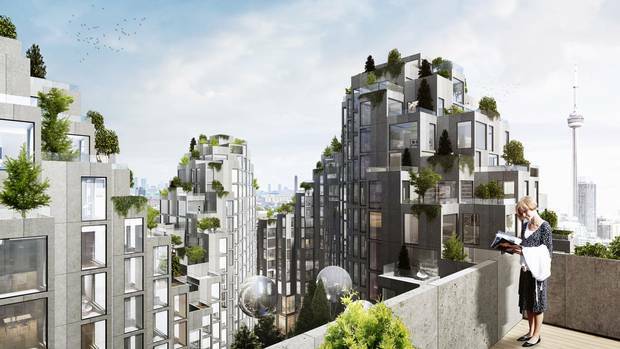 This idea of houses in the sky echoes the dreams of the young Moshe Safdie in his Habitat for Expo 1967 in Montreal – in which he tried to bring together suburban spaciousness and urban density – and also various BIG designs, including the Mountain in Copenhagen. But what's more important is how the building meets the street. It would lift up off the sidewalk at three points, allowing pedestrians to walk from King Street through to the courtyard, and, potentially, all the way through the block to Wellington Street beyond. A model of the King Street development is shown in Mr. Ingels’s New York office. Why does this matter? The city block is unusually deep, nearly 140 metres from north to south. It was developed a century ago with a haphazard network of lanes and passages; today it's home to a pleasant hodgepodge of restaurant patios and back entrances. The BIG scheme picks up on this logic by integrating similar, publicly accessible pathways within the structure itself. As urban design, this is deeply unusual. It fuses the utopian form-making of 1960s modernists, like Mr. Safdie's Habitat, with the traditional concern for a streetscape filled with varied activity. Jane Jacobs might have hated the peaks; she would have liked the courtyard and the way the building forms a consistent wall along the street. As Mr. Ingels puts it, the building type "that has dominated Toronto development over the last decades is the tower and podium. What we're trying to do is retain the street wall at a level familiar to King Street, and then have the peaks step back from there." Ken Greenberg, the urban designer and planner, is working on the project; he also lives nearby, and has been a strong local advocate for sensitive, human-scaled development. He argues that BIG's design could provide an ambitious model of "how people are actually living in the city in the 21st century." Mr. Greenberg asks: "Through looking at that problem through fresh eyes, can you get a better quality of life?" The answer, Mr. Ingels argues with characteristic confidence, is yes. "Commerical real estate suffers from the self-fulfilling prophecy: You can only point to what's already out there and say, 'This is what people want,' " he says. "It's true anywhere that people are different, and so places to live and neighbourhoods should be different – and I think this is especially true in Toronto. It would be sad if the most diverse city in the world had the most homogenous real estate." Alex Bozikovic is The Globe and Mail's architecture critic. 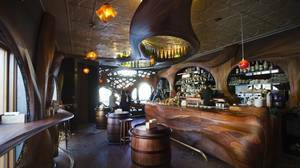 Toronto in 2015: The best of city building The Globe and Mail's architecture critic offers his take on Toronto’s best design projects of the year. 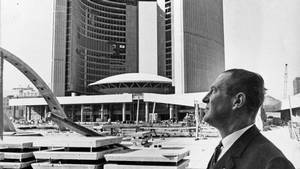 Toronto in 1965: Hall's well that ends well In 1965, a parochial, prudish city took an unusually bold leap – and Toronto’s curvaceous, modern City Hall opened its doors. But it took a happy historical accident for the design to get off the ground.